Dementia is the name given to a group of symptoms that affect a person’s ability to function. It can cause confusion, memory loss, irritability or other changes in personality, and creates risk to the safety of those living with it. Dementia is a progressive decline in capability, and while there is no cure, early diagnosis can help families make positive changes that can adapt as needs change. There are warning signs of dementia you can watch for, and they should never be ignored. A loved one’s inability to remember details or to lose track of time or orientation is likely the most well known concern in dementia care. It can create safety issues in all areas as a senior parent tries to take care of themselves, their home, and their personal and financial affairs. Consult with a doctor to get an unbiased measure of their abilities, including cognitive function, vision, and memory. This would be a good place to start a discussion and will inform decisions in all other areas. What can your loved one still do for themselves, and where do they need support? How might this change and how will you adapt? Changes to a familiar environment or routine can cause someone with dementia to be less confident in moving throughout their day. Simply moving furniture around can create hazards, as can adding or removing mats and rugs in the home. Monitor your loved one’s physical capabilities carefully, watching for changes in ability, balance, and/or confidence. They may need adjustments in their home, routine or even in their footwear to ensure they are able to stay injury-free. Managing medication is an area that can create serious risk for those with dementia, and is definitely a topic that should be discussed with a doctor, as well as a pharmacist. Both are likely to have practical suggestions and cautions for you to consider. In early phases, simply managing prescriptions more carefully can be helpful, whereas later on this may be an area where a senior simply needs intervention and support to stay safe. A caregiver or companion can make scheduled visits to ensure medication is taken on schedule and in appropriate doses. Visits to doctors, specialists, or other practitioners may also suddenly become a challenge but are important to keep consistent. It is safer to have someone else assume responsibility for certain areas of safety in the home once someone has been diagnosed with dementia. Regular testing of devices like smoke and carbon monoxide detectors could easily be taken care of by someone else to increase peace of mind. Walk through the home, simplify as much as possible and look for potential sources of danger and ways to mitigate risk. Remove dangling cords, loose mats, and anything in need of repair. Better to have fewer pieces that are sturdy and safe, and floors clear of obstacles. Be cautious of items that can be plugged in and left unattended – remove these or replace with devices that shut off automatically if forgotten. While someone with dementia may be able to manage getting around in the early phases, it’s likely this will become a challenge that needs to be carefully handled. Discussions should be had to find out where they need and want to go on a regular basis, and decisions made on how to handle these trips. Do you need someone to come take them to appointments, or to church or community events? Do they like to walk regularly but occasionally lose their bearings? How can they stay involved in their community, but still stay safe? Caring for those with dementia can be overwhelming for families to manage on their own. It is important to note that it can be valuable to obtain an early diagnosis if you suspect a loved one is showing signs of dementia. This can allow your family to explore supports, have important discussions and make small changes to routine during early phases when adjustment comes more easily. Caregivers who have experience with dementia will be better equipped to handle the confusion, memory loss, and changes in personality that can occur. They will also know how to help offer care and support without increasing stress or frustration, simply from their experience and knowledge. This can create a safer, more consistent routine for those with dementia. What are the first steps to take if your senior parent is experiencing warning signs of dementia? The first step is always to see a family doctor to rule out any health concerns that may mimic the symptoms of dementia. Early diagnosis allows you to learn more about dementia, and the phases that your loved one might go through. You can then create a plan for care that will work for their current situation, with steps discussed for whatever may lie ahead. Dementia creates a special need for care and support that may be more than you can manage as a family. 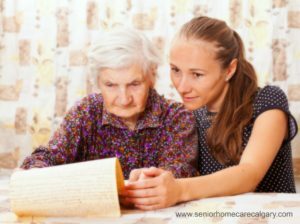 It may be practical to have a caregiver or companion offer support so the whole family can have peace of mind. We recommend a visit to a family doctor, but we’re always happy to help offer our support as you take the necessary steps. We also offer a free in-home safety assessment, which is a comprehensive safety review of the home with a single objective, to prevent costly injuries. The review covers inside and outside of the home, and we check every room in detail and provide a complete and thorough report with recommendations to you via email. This can be used to help create a safer environment and an appropriate plan for support for your aging loved one.